Flythrough movie showing the bathymetry of Carnarvon shelf, highlighting benthic habitats at Point Cloates. The bathymetric image is derived from multibeam sonar collected in 2008 using a 300 kHz Simrad EM3002 system on RV Solander. Key features on the shelf include a prominent ridge at 60 m water depth and a complex area of smaller ridges and mounds across the inner shelf. 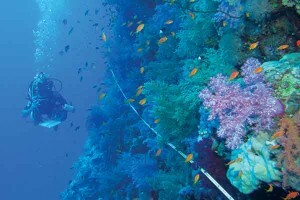 Submarine canyons are areas of high biological productivity and aggregating marine life, from deep-sea corals to foraging blue whales. A better understanding of how the physical, biological and ecological characteristics of canyons are shaped on a national scale would help to prioritise their conservation and sustainable use. This project generated a better understanding of how submarine canyons may influence biodiversity patterns across marine regions, including within and between CMRs. It mapped and measured Australia’s submarine canyons, classified their structure, and determined how they are linked: to each other, to the deep ocean, and to the continental shelf. A central question was whether all canyons functioned similarly with respect to the physical processes that influence biodiversity. 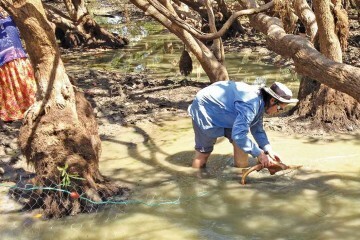 Connectivity modelling enabled the strength and direction of population links between canyons to be examined: for example, whether the exchange is upstream, downstream or both ways. The degree to which an area contributes to other areas is its source capacity; the degree to which it receives from other locations is its sink capacity. Canyons with high sink capacity encourage larval settlement, and are likely to have high resilience due to their strong connectivity with larval sources. Canyons with a high source capacity can boost ecological resilience by exporting larvae to other locations. National map of submarine canyons in relation to Commonwealth Marine Reserves. 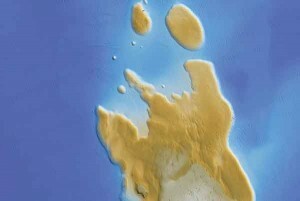 IMAGE: Geosciences Australia. Tools and methods were developed to examine the relationships between canyons, large-scale ocean currents and biodiversity values. New bathymetric maps were generated, and indicators of ocean productivity across the Exclusive Economic Zone (EEZ) were derived from time-series maps of sea-surface properties (temperature, chlorophyll-a, turbidity). 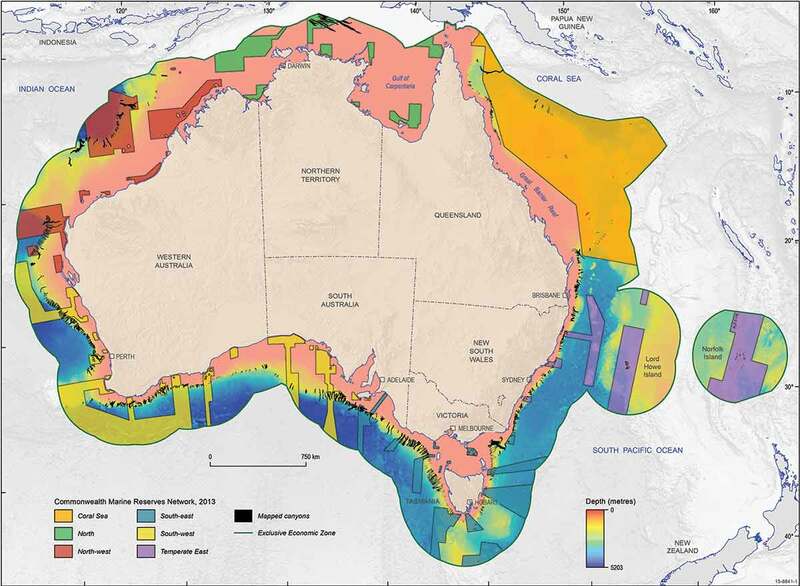 Remote sensing techniques were also used to define the spatial and temporal variability of the Leeuwin Current, as a case study for the South-west Marine Region. Spatial statistical methods were used to classify canyon types (such as shelf-incising and slope-confined) and fish distribution patterns, to examine relationships between canyons, canyon types, and other seabed features, and to identify areas of conservation priority. A new acoustic methodology that can consistently differentiate hard from soft substrate was developed to classify potential benthic habitats associated with canyons. A uniform scoring method was used to classify epibenthic fauna in these habitats from seafloor video imagery (656,649 records from 12 voyages). Shelf-incising canyons were analysed and their habitat types and fauna compared to the surrounding slope, with the expectation that relatively high proportions of hard substrates and associated fauna would be found where canyons incise the shelf edge. An individual-based dispersal model (see story Modelling connectivity) was used to simulate the movement of marine larvae from the coastline to the 200 nautical mile limit of the EEZ (excluding external territories). 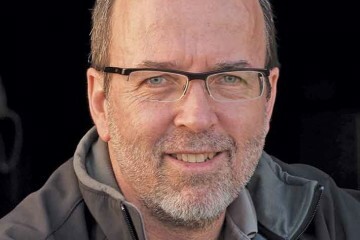 Their connectivity – the degree of exchange between two different populations or areas – was measured at local (canyon), regional and continental scales according to the scale of larval transportation. The model was used in case studies exploring the source/sink capacity of canyons in CMRs of the South-west and North-west marine planning regions. ABOVE: Simulated dispersal of brittle star larvae originating in north and north-western CMR waters for 2009–2012. Warm colours indicate relatively high larval densities, and cooler colours show areas where lower larval densities are expected. Image: Geoscience Australia. 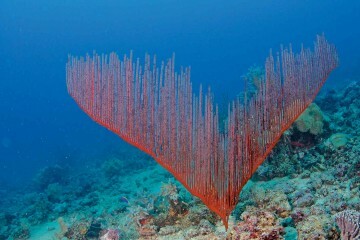 More than 750 canyons were mapped across the Australian margin, including Norfolk Island and Cocos Island Territories. This is many more than previously known. Almost 40% of the canyons were in a marine reserve, and of the 29 canyons that were identified as having high biodiversity value, 24 are located in existing Key Ecological Features (KEFs) and CMRs. Hard ground habitats in the 150-700 m depth range were both infrequent and quite highly variable between canyons for the 60 shelf incising canyons for which data were available. Video imagery showed benthic epifauna abundance to be depth stratified and higher inside canyons. 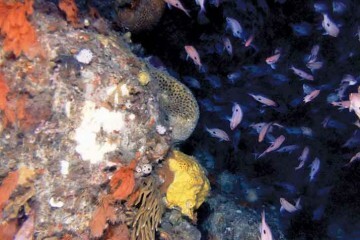 Seabed hardness was an important habitat classifier for a large subset of the fauna. Based on the video imagery, the shelf incising canyons did not support significantly different epibenthic macrofauna when compared to other upper slope hard and soft substrate. Canyon-specific metrics of epifauna biomass and distribution, and finer taxonomic resolution of fauna, appear to be needed to resolve biodiversity distribution patterns within and outside canyons. This will be necessary for any prioritisation of individual features or areas for management attention. 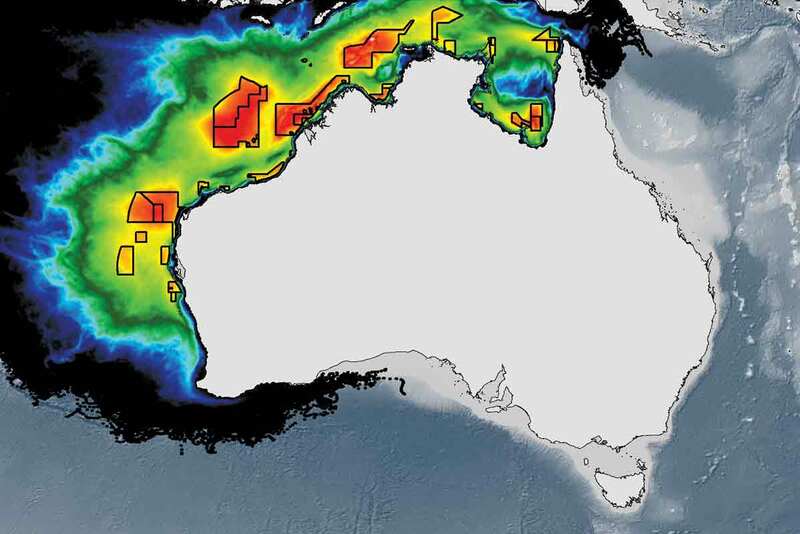 A study of connectivity in the South-west Marine Region conducted as part of this project found the Albany Canyons off south-western Australia to be an important sink and source for marine larvae transported eastward by the Leeuwin Current. Twenty-five of the 81 Albany canyons had medium to high sink and source capacity: mostly the larger, topographically complex canyons such as Wilson and Bremer canyons, suggesting that these two canyons may have a larger role in maintaining the biodiversity of this area than the other canyons. The strong connectivity of these Albany Canyons is driven by the Leeuwin Current and augmented by secondary flows that recirculate the larvae dispersal cloud westward, providing additional opportunity for larval settlement. Smaller canyons to the east, at the downstream end of the current’s dispersal path, and outside CMRs, tended to have a low relative sink and source capacity. The individual-based model also showed that time-series earth observations are effective in mapping the Leeuwin Current and to quantitatively investigate the temporal variability of its oceanographic and geographical characteristics. The findings indicate that the Leeuwin Current has strong seasonal and inter-annual variation in its area of influence and cross-shelf migration. The Leeuwin Current also has a significantly positive influence over the nutrient characteristics of the South-west Marine Region. 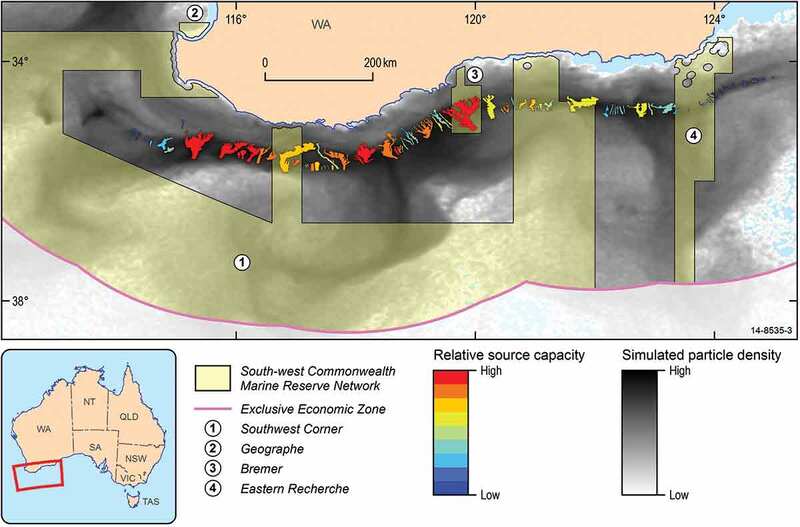 A study of canyons in the North-west Marine Region conducted as part of this project focussed on canyons that intersect several CMRs offshore from Cape Range Peninsula (Gascoyne, Carnarvon Canyon and Ningaloo). The connectivity model showed a higher sink and source capacity for canyons in the northern half of the group, with most of those canyons intersecting the Gascoyne CMR. In contrast, canyons within the Carnarvon Canyon CMR had low sink and source capacity for marine larvae. 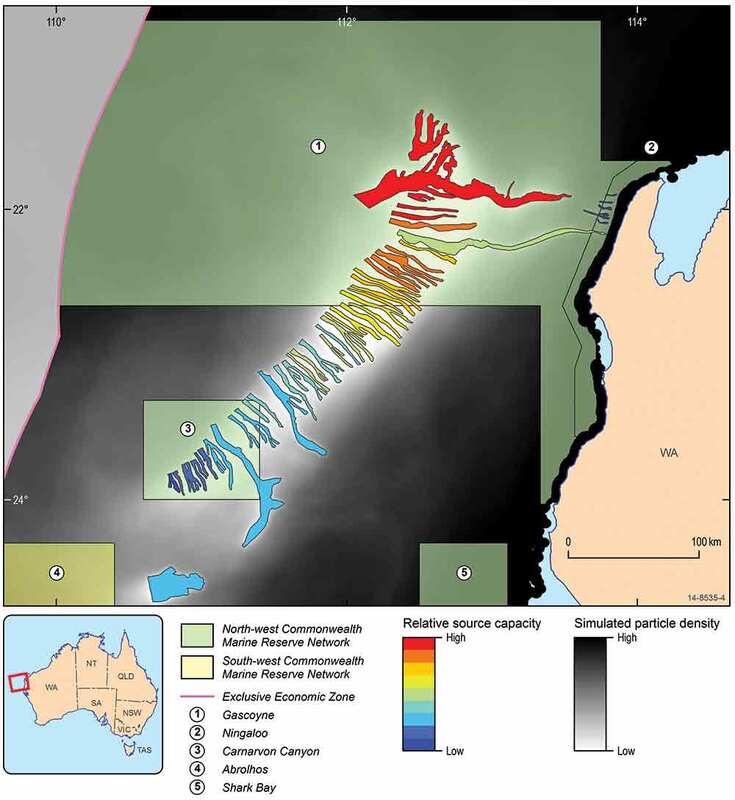 This variability in sink and source capacity across a relatively small area reflects the ‘decay’ of the dispersal cloud along the direction of the Leeuwin Current and with distance offshore. Similarly, the shelf-incising canyons that intersect Ningaloo CMR have low sink capacity due to their weaker links with the Leeuwin Current. ALBANY CANYONS: capacity to act as a source for marine larvae. ABOVE: Albany Canyons showing the capacity for each canyon to act as a source for marine larvae, modelled for larval release across the South-west marine region in 2009 (represented by the grey dispersal cloud). 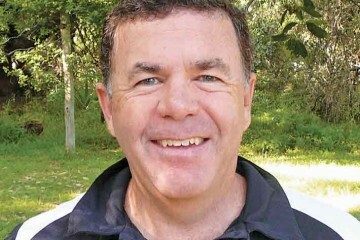 Image: Geoscience Australia. Datasets and models produced in this project provide a foundation for targeted studies aimed at testing/validating components of the connectivity patterns identified by the dispersal model. 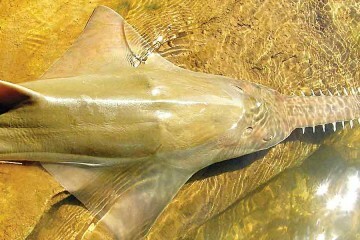 This project is producing a comprehensive assessment of Australian canyons as habitat for benthic and pelagic species. 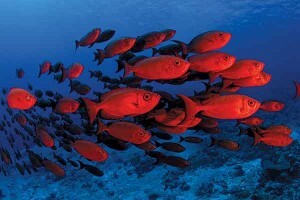 The assessment is using biodiversity surrogates, (such as seafloor rugosity, upwelling strength and current velocity), to classify habitat complexity, productivity and disturbance. Geomorphometrics, (measures of seafloor complexity), such as canyon distribution and seafloor rugosity have an important influence on the movements of large fish predators over macro-ecological scales. The connectivity model and canyon maps can be used to identify data gaps and priority areas for future observations and sampling, either to reduce uncertainty in lesser known areas such as the North-west Marine Planning Region, or to confirm the presence of locally important biodiversity values inside and outside the CMR network. The modelling can also explore connectivity patterns between marine regions and interdependent geographic regions, and reveal areas that may have a relatively higher role in maintaining the biodiversity of the area. 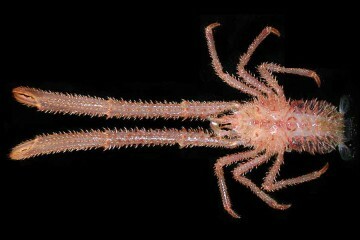 For example, the models predict strong ophiuroid connectivity between the Oceanic Shoals and Kimberley CMRs. ABOVE: Cape Range Canyons showing the relative capacity of each canyon to act as a source for marine larvae, modelled for larval release across the North-west marine region for 2009 (represented by the grey dispersal cloud). Image: Geoscience Australia. The study produced national canyon and Leeuwin Current datasets in GIS format, a time series MODIS dataset in GIS and remote sensing formats, and a national-scale point cloud database of simulated marine larval dispersal. This database is incorporated in the connectivity model, and can be used to determine expected levels of connectivity among user-defined geographic areas and depths (such as CMRs and KEFs). A nationally consistent map of canyons on the Australian margin, and maps of hard and soft substrate for shelf incising canyons and compiled video annotation data, were also produced. 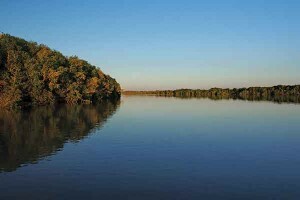 This information can be used to develop a better understanding of how topographic features influence biodiversity patterns in areas such as Ningaloo Reef, and can also be applied in studies of ecosystem processes, such as studies of population connectivity among these features. Outputs from the connectivity model are publically available and have been applied to a range of resource management challenges: by the Australian Fisheries Management Authority Slope Resource Assessment Group to investigate geographic stocks of Blue Eye Trevalla; by James Cook University to study Wideband Anemonefish; and by the University of Western Australia to study coral dispersal from the Abrolhos Islands. Cross-agency information sharing and collaboration has also covered science-management communication, ocean currents and upwelling processes.